If you’ve been in the ecommerce game for any length of time, you’ve heard those terms. Most retailers have a vague idea of what they mean and how to use them. But how do you actually hone in on the techniques guaranteed to boost your sales? Done well, urgency can build engagement, boost desktop conversion rates, helps in mobile conversion optimization and even positively impact customer loyalty. Done poorly, the complete opposite is true. In this post, we want to cover 14 of the best techniques for creating more urgency on your ecommerce product pages. Even if you only pick two or three that are a fit for your store, the results can be dramatic. Why is urgency a no-brainer for ecommerce? The great thing about building urgency into your product pages is that it’s very easy to do. 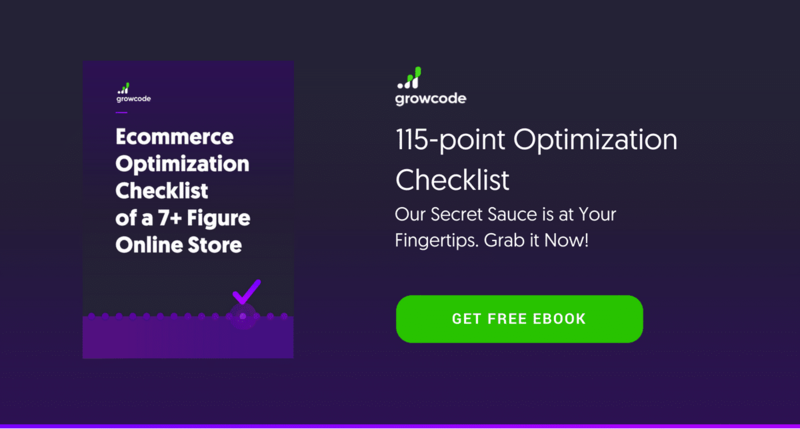 At Growcode, we often see conversion rate increases of 7% – 9% after implementing only a handful of these techniques. You only need to make a few simple changes to optimizating your product page template and you can boost sales across hundreds, thousands or even tens of thousands of products. All in a few clicks. Testing urgency-building techniques is also a relatively simple matter. A/B testing a new countdown button or time-sensitive promotion across a few products before a full rollout, for example, carries very little risk. Urgency is simply an experience of unease caused by perceived scarcity. In a sales environment, this unease motivates individuals to acquire scarce products by making a purchase. Urgency works for a simple reason. Studies show that at a fundamental level, humans fear loss more than they desire gain. We are hard-wired to act in circumstances marked by scarcity or the potential loss of a valuable resource. Compared to the customers who got only the standard sales appeal, those who were also told about the future scarcity of beef bought more than twice as much. How to Create Urgency on Ecommerce Product Pages? This is a technique that a number of ecommerce stores, like Amazon, use to great effect. One of the traditional problems that online retailers face is the innate desire among buyers for instant gratification. Adding the specific time left to claim a delivery offer – “You have 10 minutes to get one-day delivery” – further intensifies scarcity. This is also one of the current ecommerce trends. By offering delivery by a specific date, you’ll kill two birds with one stone. You’ll be prompting users to buy by creating urgency on product page and you’ll also provide a degree of instant-gratification. If buyers don’t act, that delivery slot disappears, along with the positive feeling of having a product straight away. In one study 75% of buyers said they preferred to receive their purchases on the same day. Retailers should never underestimate the “want it now” mentality. If customers know that they will receive goods quickly when they order, they’ll keep coming back. One of the reasons that sales events work so well is because they evoke powerful feelings of scarcity. Customers are drawn by the prospect of a cheap deal, but they also understand that stock is limited and that demand will be high. Anybody who has ever seen the queues outside high street stores on the morning of a sale can attest to this fact. If your sale is ongoing, adding a snippet of text like “Final Sale” or “While Stocks Last” is a good strategy. This is what Forever 21 did with their 50% off sale. The ecommerce development mistake most ecommerce retailers make is not including sale information on product pages. You should always highlight discount information, like coupon codes, alongside the price. You can further build product page urgency by including the sale end date. You might also consider adding alerts indicating stock levels. The obvious example is to notify customers of “Low stock!” But you can also cleverly use notifications when you have high or medium-levels of stock to create urgency, irrespective of how many products you have available. 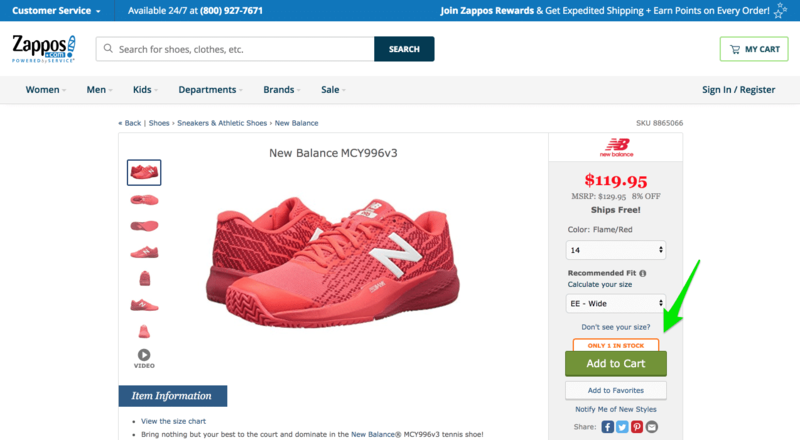 Zappos include specific stock warnings, like “Only 1 in Stock”, just above their CTA. It goes without saying that promotions should have a time-limit. Because they’re so successful, many ecommerce retailers now run sales all the time. But this approach limits the potential for scarcity-building. If you are thinking about offering a promotion or discount, attach a specific end-date to it. Even if you expect to run the offer for a long period of time, you can always set an arbitrary end-date and extend later on “Due to Popular Demand”. In the example above, HP adds specific information about which discounts will no longer apply to their computing products after a certain time. Note how they also include “Free Shipping” alongside the promotion end-date. Following on from the previous point, one way to indicate buyer competition is to show how many people are “viewing” or “thinking about buying” a product. 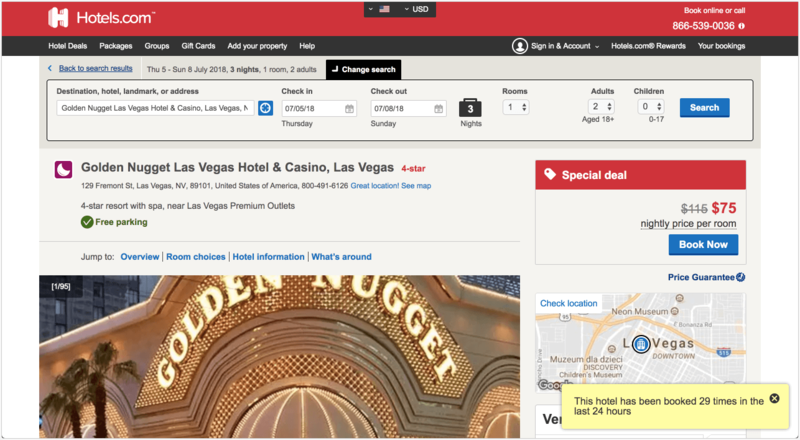 Booking.com use this tactic to great effect by letting visitors know how many other people are looking at a room. Note how, in the screenshot above, they also highlight the number of rooms available. When combined with a notification about limited levels of availability, this can be a very powerful strategy. If there’s notable uncertainty and weak social proof, negative conversion impact is possible. If quality social proof buffers notable uncertainty, get ready for some remarkable conversion impact – in some cases up to 400% improvement. You will be able to build scarcity much more effectively if you tie definite, concrete information with limited availability. Showing exact stock levels is one way of doing this. Another is to alert customers to the number of people that have made a purchase in the previous 24 hours. 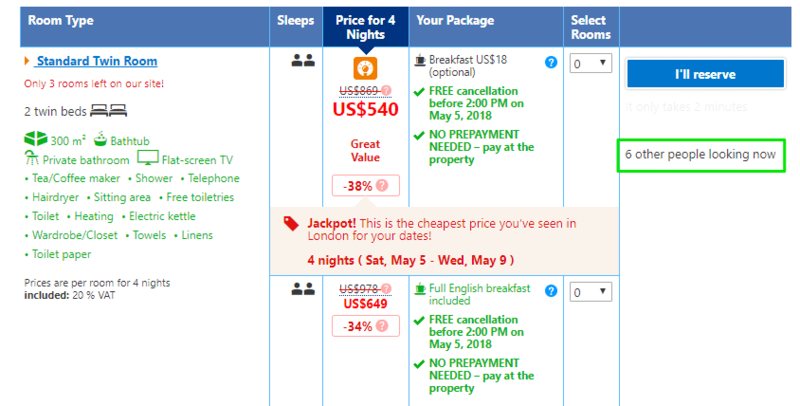 Hotels.com show 24-hour purchasing activity with an unobtrusive pop-up. Simple but effective! One more example for showing definite buyer interest, and thus creating scarcity and urgency on product page, is to show the name of the most recent purchaser of a product. By providing a name (and even a location) you give solid evidence of buyer interest. This can even work without significant buyer interest in a product. You can always show sales of related products or even sales in a whole category. We’ve used this strategy for our clients numerous times and we know it works. The example above, which uses a simple Shopify app called Bizzy Social Proof, shows how an unobtrusive pop-up can showcase this information. All that’s needed is a short notification like “Jim from Texas has just purchased this!” Because the action is tied to a person, it becomes much more believable and powerful. It can also create an atmosphere of a buying frenzy, further encouraging people to make the jump. Along with creating urgency around the product itself, it can be worthwhile to add a time-sensitive bonus offer. This might be a site-wide promotion – “15% off all purchases until Sunday” – or one that’s exclusive to a specific product. 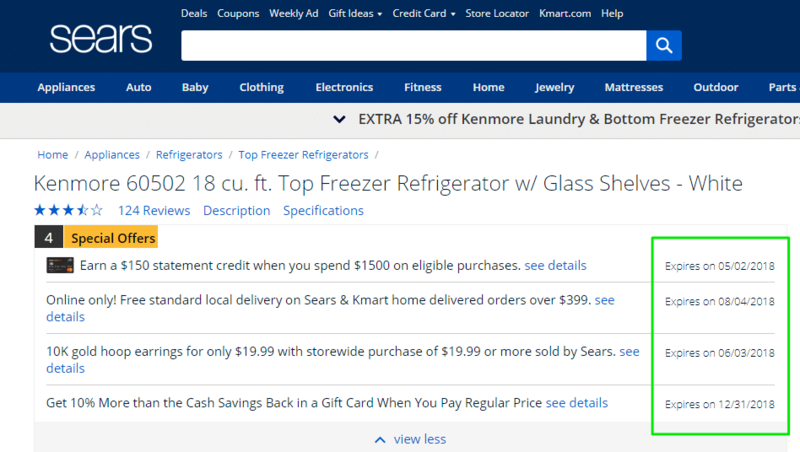 This is what Sears does by offering bonuses alongside major purchases, like a discount on gold earrings when you buy a fridge. All of these have a visible expiry date. Site-wide promotions can be tailored to appear as though they are unique to a specific product with clever copy. In reality, many of the same offers apply to different Sears products. Buying holidays, like Valentine’s Day, Black Friday and Christmas, are among the busiest times for ecommerce stores, and people are more worried than usual about getting gifts on time. With hordes of site visitors, it’s important to build scarcity as much as possible by emphasizing the time-limitedness of holiday offers. Many of the techniques on this list, such as free delivery and time-sensitive bonuses, can be used in conjunction with alerts about special offers. BTW find out 6 Holiday Ecommerce Optimization Tips to Increase Your Online Sales! Scarcity is one of the best ways to encourage already-eager buyers to spend more, so make sure you emphasize the fact that product availability is limited to a specific day or season, especially when buying holidays are coming to an end. Suggest products relentlessly without taking them out of their flow. Every additional purchase here just adds to the bottom line for better conversion rate of your ecommerce business. The use of buying holidays is an unobtrusive way to do this. One way to take advantage of the “sales bug” without developing a reputation for being in constant “sales mode” is by offering flash sales or time-limited “mystery” promotions. This is an excellent way to encourage buying, especially outside of peak times, because the pretext for offering discounts is to provide value and fun. Remember, the key is to alert buyers to offers on your product pages. Pre-releases work exceptionally well for a number of reasons but particularly when there’s been lots of build-up for a new product. Games console companies, like Xbox and PlayStation, have this tactic down to a tee. By offering a limited amount of units before the official release date, you can instantly create scarcity. Kinguin often run pre-orders to generate interests and leverage a fear-of-missing out. For those customers that don’t manage to buy a limited item, the fact that they just missed out will further boost their desire to buy when the product finally does become available. You can usually entice these potential customers with another offer, such as an “early bird” list for the first batch of stock. How many limited-edition chocolate bars have you bought in the last twelve months? An answer in the double figures wouldn’t be surprising. The reason that candy-makers are always using this strategy is that they know it creates a sense of urgency among buyers. Sephora regularly offers limited edition versions of popular products. 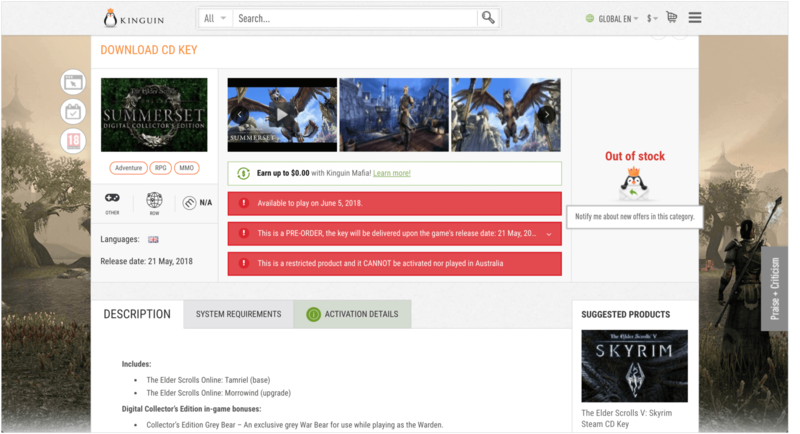 You might be thinking, “But surely that’s a short-term strategy?” The real key to selling limited-edition products is regular releases, indicating that only a certain amount are available on the product page. Rather than simply offering visitors a discount for their first offer, why not attach at time limit? This strategy provides two benefits. On the one hand, it builds urgency to incentivize visitors to sign up to your mailing list. On the other, it encourages immediate buying by only allowing purchases for a finite time. 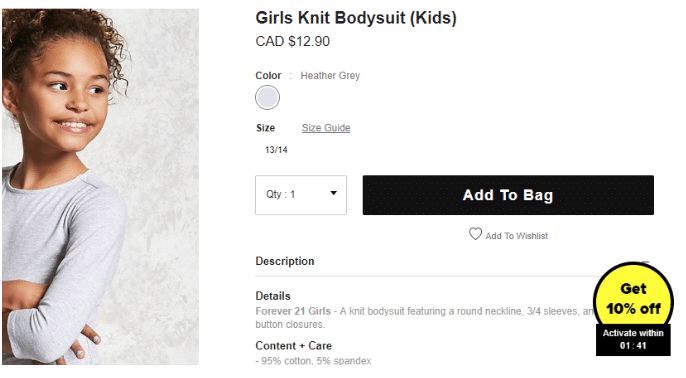 This is what Forever 21 do with their time-limited “Get 10% Off” offer for new customers. 14. Show a countdown timer! OK, so no list would be complete without mentioning the countdown timer! 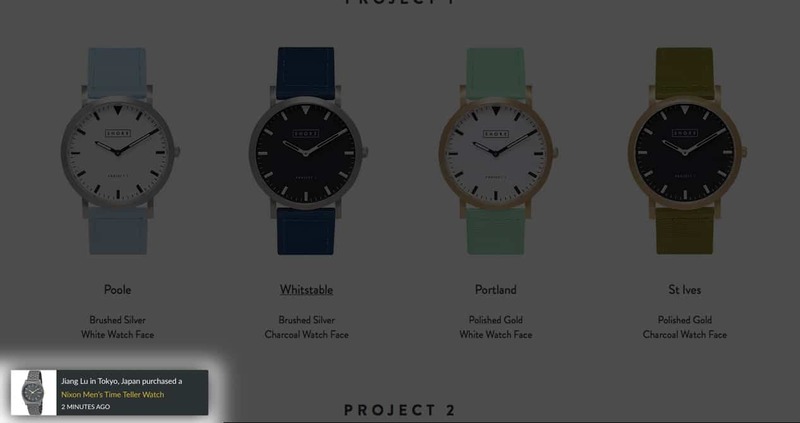 You can use timers to build real-time scarcity in relation to any offer on a product page, whether it’s sale end times, one-day delivery or pre-orders. Ok, so you’ve picked your favorites and you’re ready to start testing. Great copy is the glue that holds all of these urgency-building tweaks and tactics together. Let’s quickly consider an example. Which of the following two alerts do you think is more likely to be effective? You might think that both are lousy. But one is clearly better than the other. Keep in mind that whichever tactics you choose, you need to wrap them in well-written, enticing copy. Serious about not only about creating urgency but overall conversion rate optimization? Grab our free 115-point checklist!